Today is the 73rd anniversary of V-E Day — victory in Europe — marking the end of World War II in that part of the world. Six weeks earlier, on March 21, 1945, a Virginia soldier was killed by Germans while battling along the Siegfried Line. He was 27 years old, my mother’s oldest brother. His name was Clarence Osborne, the oldest of nine siblings. My mom was the baby of the family, a student at Thomas Dale High School in Chester, when her brother was killed. She still remembers her mother’s reaction that fateful day when the official government car drove up the driveway of their Chesterfield County farm many decades ago, and how her mother’s knees buckled as she realized the presence of that car meant her son had been killed. Mom says her mother, who lived into her 80s, never completely got over the loss. After retiring, Mom spent hours researching to fill the void of not knowing exactly what happened to her brother and eventually found Clarence’s sergeant, Dock Roberts, living in Texas. Another soldier buddy, Emelio Albert, lived in California. She traveled to both places to talk with them to learn about her brother’s journey as a U.S. Army soldier through war-torn Europe and his final hours, and she documented the treasured research for our family history. Here are her words about her oldest brother’s final months at war … by Eula Osborne Randall Lucy. The Italian Campaign was one of the most difficult of World War II, and some of the most difficult battles for foot soldiers were in Italy which was very mountainous with heavy snows in the winter of 1943 and heavy cold rains in the late winter and spring of 1944. The earth turned into a quagmire and foxholes were filled with water. Mud was so deep it was nearly impassable for vehicles as well as men on foot. In the summer of 1944, the ground turned to dust which swirled at the least disturbance. The unit veterans’ most vivid memories of the Italian fighting was the weather and terrain. 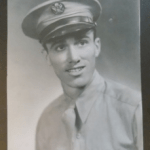 Clarence spent 15 months as a First Gunner in a Mortar Squad, part of the American forces who freed the little town of San Pietro in southern Italy from the Germans. From there they battled their way to the Riviera in southern France and on to the northern border of France, plus one day on Germany. He was killed in the last great battle the 36th Division of the 1st Battalion, Company D, 143rd Infantry Regiment of the Texas National Guard. Clarence’s first battle was December 15, 1943. Starting December 8th, the 36th Division had been trying to take 4,000-foot Mt. Summacro (Hill 1205) so they could liberate the little town of San Pietro at the base of the mountain. Dock Roberts, Clarence’s sergeant, and Roy Goad, Commanding Officer of the 143rd Regiment, were wounded on Hill 1205. San Pietro was at the entrance to the Liri Valley and was heavily fortified by the Germans. It had to be taken by the Allies before they could enter the Liri Valley in the drive to liberate Rome. The men of the 36th Division had come into Italy after fighting in the deserts of North Africa and were still wearing their summer uniforms. They were not prepared for the bitterest winter Italy had experienced in years. Most had no overcoats, raincoats, or even gloves. Much of the fighting for Hill 1205 was by climbing, literally hand over hand, straight up the side of the mountain which was very rugged with sharp, jagged rocks. Germans were entrenched on the top, protected by large boulders along the edge of the top of the mountain. When the first Allied soldiers reached the top and surprised them, the Germans started rolling large boulders off the mountain. The 1st Battalion of the 143rd Infantry Regiment moved on from Hill 1205 to the battle to liberate San Pietro at the bottom. Clarence was a replacement for the 36th Division and entered the fighting on December 15th. The next day they finally succeeded in capturing San Pietro but a high price was paid with 1,100 casualties. Two U.S. service members were killed and five others were injured conducting combat operations in northern Iraq today, Combined Joint Task Force Operation Inherent Resolve officials reported today. 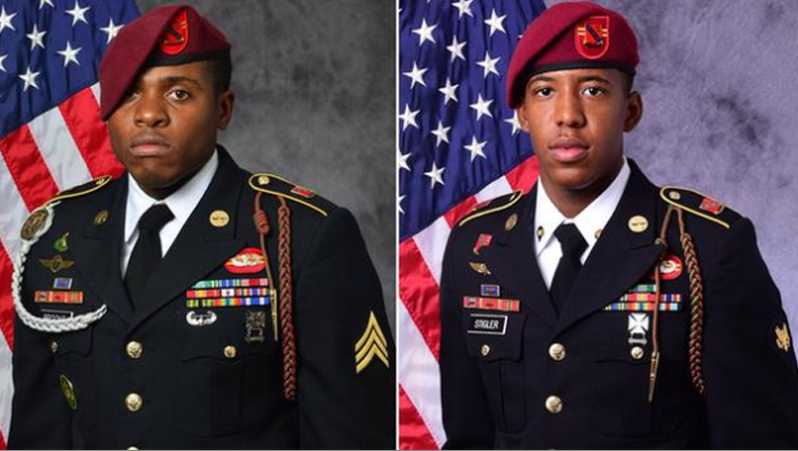 The two soldiers were identified as Sgt. Roshain E. Brooks, 30, of Brooklyn, New York, and Spc. Allen Levi Stigler Jr., 22, of Arlington, Texas. Both were with the 2nd Battalion, 319th Airborne Field Artillery Regiment, 2nd Brigade Combat Team, 82nd Airborne Division, from Fort Bragg, North Carolina. An artillery round meant to be fired at an Islamic State target in northern Iraq on Sunday exploded prematurely, defense officials said. Despite ISIS’ claims Sunday that it killed the soldiers with rocket fire, Manning said “there is no indication at all that ISIS had anything to do with” the soldiers’ deaths. He said the incident was under investigation. Sgt. Brooks joined the Army in July 2012 and deployed to Afghanistan from June to November 2014. 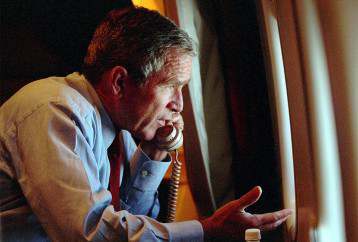 This was his first deployment to Iraq. He had been awarded the Army Commendation Medal with “C” Device, the Army Achievement Medal, the National Defense Service Medal, the Global War on Terrorism Service Medal, the Iraq Campaign Medal with Campaign Star, the Parachutist Badge and the Air Assault Badge. Spc. Stigler joined the Army in November 2013. He was assigned to the Second Infantry Division in Camp Casey, Korea from May 2014 to June 2015 following his completion of combat training and advanced individual training. In July 2015, he was assigned to the 82nd Airborne Division. This was his first combat deployment. Several decorations had been awarded to Spc. Stigler while serving including the Iraq Campaign Medal with Campaign Star, the Parachutist Badge, and the National Defense Service Medal among others. Spc. Stigler and Sgt. Brooks were posthumously awarded the Bronze Star, Purple Heart, Meritorious Service Medal, and Combat Action Badge. U.S. troops worked alongside Iraqi security forces to train and advise them throughout their brutal nine-month battle to retake Mosul, the final major city that the terrorist group held in Iraq. The city has been largely turned over to Iraqi Federal Police, described as “hold forces,” who are clearing it of any remaining ISIS fighters and explosives, Manning said. It seems to be an afterthought in America when we lose American military members. We’ve been at war for a long time, and military families lose loved ones, yet it is difficult to know it from the lack of news when there are casualties. Sunday as we mourned the loss of three lives during the violence in Charlottesville, these soldiers lost their lives in combat. Families and friends in New York and Texas are mourning. Saying “thank you” somehow seems to fall short. The sadness I feel at this moment is nothing compared to how the parents of 22-year-old Otto Warmbier must be feeling after the death of their son Monday afternoon. A comatose Otto had been returned to the United States only a week ago. His crime? Supposedly swiping a poster in a North Korean hotel, never proven. Monday, June 6, 2016, was a day for sights and sounds and memories and stories from some of the few remaining veterans who survived June 6, 1944. It was the 72nd anniversary of Operation Overlord — the allied invasion of Normandy, known as D-Day — that marked the beginning of the end of World War II. Exiting the four-lane highway in Bedford and turning onto Overlord Drive, it is a quiet drive through open fields up the hill to a place of reverence and thankfulness. 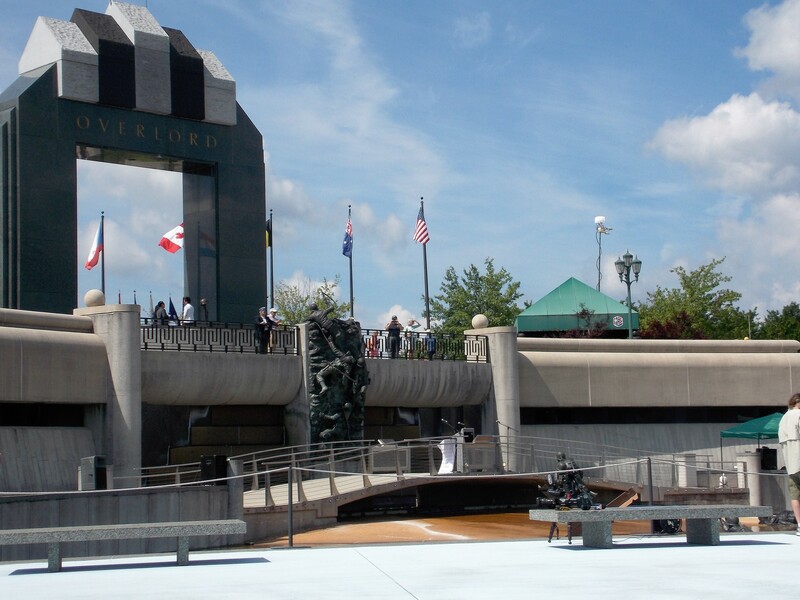 Surrounded by the peaceful Virginia countryside with the Blue Ridge Mountains, including Sharp Top and Flat Top mountains that form the Peaks of Otter in the distance, the National D-Day Memorial provides an opportunity to learn and reflect on a pivoting event in America’s — and the world’s — history. The overwhelming extent of the sacrifices made as well as the huge operation that involved 150,000 Allied troops, 5,000 ships, 11,000 aircraft, and huge losses of more than 9,000 Allied soldier who died, including 2,499 American soldiers, in the largest amphibious landing the world has ever seen, was sobering. The liberation of Europe began that day and, though the war would continue for almost a year longer, the Normandy invasion gave Allied forces an opening to begin working their way across Europe to defeat Hitler. Thankfully, the vision of D-Day veteran Bob Slaughter to have a national site to remember and honor those involved was achieved, and the National D-Day Memorial was dedicated on June 6th, 2001, by President George W. Bush. My husband and I arrived early on Monday and stayed into the afternoon — attending the 11am ceremony, strolling the grounds, reading the historical plaques, and listening to the roll call of names. We left with a renewed appreciation for the Greatest Generation. Below are photos that capture a small part of the day. May we never forget. 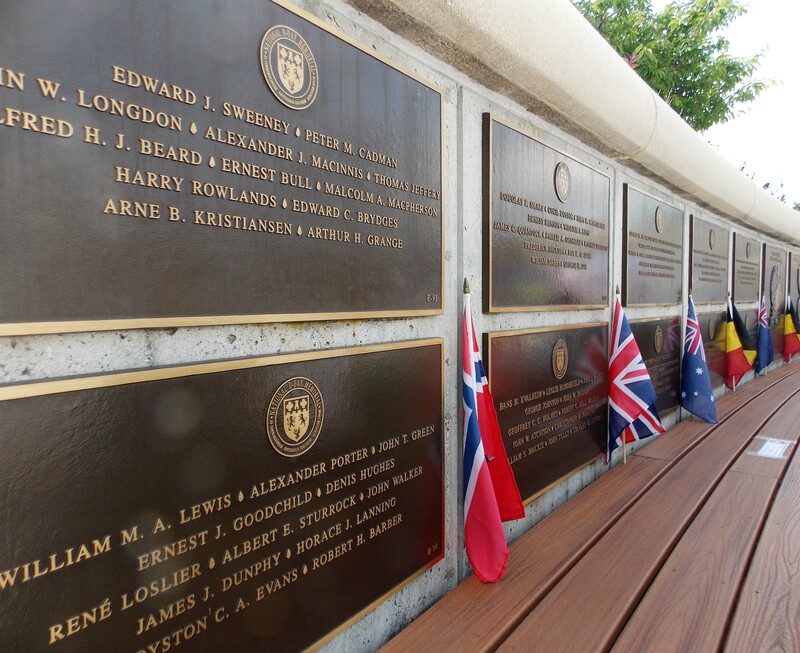 Why Bedford for the national memorial? As explained in the video, the memorial is a reminder of the extreme sacrifice the small Virginia town at the foot of the Blue Ridge Mountains made during the invasion on June 6, 1946. They lost more men per capita than any other location in America. Of the 30 Bedford soldiers in Company A, 19 perished that day and four others during the war. That sacrifice by the Bedford Boys was the reason their town was chosen as the site for the national memorial. For photos of the memorial’s tribute to the Bedford Boys, see 72 years later … the Bedford Boys. For the first time ever the roll call of the names of the 2,499 Americans killed on D-Day was read by volunteers whose voices could be heard throughout the memorial’s grounds. The honoring of the fallen continued for three hours into the afternoon with names read by veterans, families, volunteers, and dignitaries. Imagine sitting in Staunton’s Gypsy Hill Park on Independence Day with your kids running around playing, friends and family in lawn chairs next to you, and the area packed with holiday revelers, some five-to-ten deep lined up to watch the 4th of July parade. Red, white, and blue balloons bob up and down on the arms of little ones … vendor awnings are decorated in patriotic colors to add to the festivities. There’s conversation and laughter as folks wait to see friends on floats and politicians in cars, and children riding tricycles and pulling wagons while waving small American flags. Imagine a tractor-trailer truck making its way up Thornrose Avenue where floats are lining up, and turning slowly into the park on the route parade participants will follow shortly. Imagine folks quizzically looking around thinking the driver was lost and had turned the wrong way. And then imagine that truck speeding up as it takes aim at the crowds of families and vendors lining the street, the driver plowing down as many pedestrians as possible while aiming a gun out the window and shooting everyone within range, as he proceeded from the Thornrose entrance of the park to the entrance near the former Tastee-Freez. That’s what happened yesterday in Nice, France, on their Bastille Day — their Independence Day — as a terrorist drove a tractor-trailer into the crowds packed in to watch fireworks, and continued driving for over a mile. This morning 84 people are reported to be dead including 10 children and teenagers, with more than 200 injuries. The dead included two Americans, a father and son, traveling together through Europe. The dad was 51 and coached his son’s baseball team; his son was 11. They were from Austin and had started their European vacation in Spain before ending up in Nice and encountering every family’s nightmare. France, once again, has become the epicenter of violence as the world weeps for those who were lost, and for the never-to-be-seen-again innocence of the past … and the war with terrorism continues. 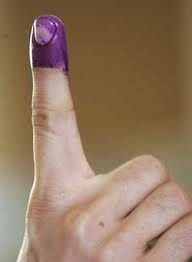 The purple-stained finger is the Afghanistan equivalent to Americans’ “I Voted” stickers on election day with a huge difference: Afghans take their lives in their hands as they defy the Taliban’s threats of election day violence. Millions of Afghans witnessed a colorful display of democracy in action as voters flocked to the polls to vote in historic presidential elections. Twitter and Facebook are brimming with images of Afghan women emerging from polling centers cloaked in blue burqas, some wearing headscarves, others carrying toddlers – but all holding up fingers stained with purple election ink, a gesture of defiance against Taliban intimidation and a return to past oppression. Millions of Afghans witnessed a colorful display of democracy in action Saturday as voters flocked to the polls to vote in historic presidential elections. Twitter and Facebook are brimming with images of Afghan women emerging from polling centers cloaked in blue burqas, some wearing headscarves, others carrying toddlers – but all holding up fingers stained with purple election ink, a gesture of defiance against Taliban intimidation and a return to past oppression. Read more about the women who have been oppressed under Taliban rule but who bravely stepped out to vote for the future of Afghanistan and young women in that country. An American Marine was killed and others seriously injured Saturday when a rocket fired by ISIS landed near his position in the town of Makhmur, 75 miles southeast of Mosul, a U.S. defense official told Fox News. The official did not want to give the exact number of wounded but said the number is less than five. 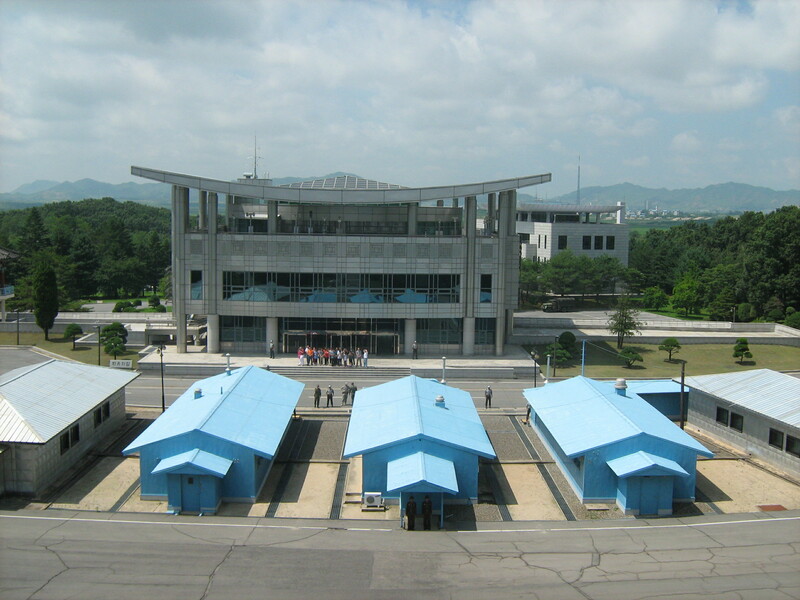 They were flown to a hospital away from the base, the official said. There are roughly 3,700 US troops on the ground in Iraq advising the Iraqi Army. Earlier this month, a brigade from the 101st Airborne Division relieved a similar sized brigade from the 82nd Airborne Division. The identity of the Marine has not been released but it is yet another reminder of the debt we owe our American military and their families. Freedom is not free. —POW Paul Galanti’s words to wife Phyllis after his release as a POW during theVietnam War, a poem he had shared with her before they married. 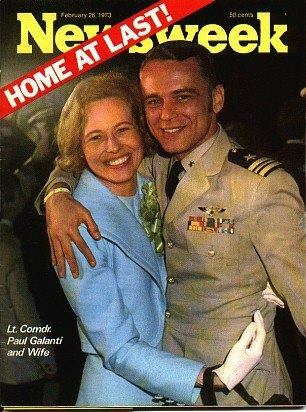 Phyllis Galanti burst onto the world stage when her husband, Paul Galanti, a Navy fighter pilot shot down over Hanoi in 1966, became a prisoner of war during the Vietnam War. She had never wanted to be in the spotlight, this quiet and unassuming lady, but in 1971, five years after her husband’s capture and imprisonment at the infamous “Hanoi Hilton,” she took her battle to have him released to the people of Virginia, America, and the world, and became a national celebrity. Sometimes the quiet reluctant ones are the chosen leaders. That was Phyllis Galanti. U.S. military command in Kabul: 1 U.S. troop killed, 2 soldiers wounded in fighting in southern Afghanistan. The fighting Tuesday against the Taliban was near the city of Marja in Helmand province, where the Taliban has made recent gains. Details on the battle and the number wounded or killed is sketchy and the situation is fluid. One U.S. official says a U.S. helicopter was sent to the scene to evacuate casualties but did not immediately take off because a mortar landed nearby. It was not clear whether the mortar has damaged the helicopter. 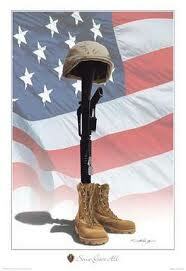 Prayers go out to the families with gratitude for their sacrifices. Freedom is not free. Pearl Harbor and 9/11 … have we forgotten? Sixty years later, on September 11, 2001, America came under an even larger attack on our soil and it wasn’t on an island in the South Pacific. It was right here on the mainland. America was attacked in New York City and Pennsylvania and the Pentagon in Washington, D.C. More people died that day than in 1941. The big difference was that they were civilians. 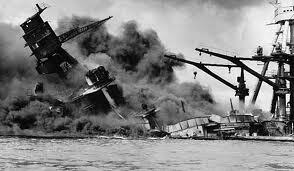 Have Americans forgotten Pearl Harbor? Most who are alive to remember are now in their 70s, 80s, and 90s. Many of the survivors have passed away … the rest are increasingly in frail health. How on God’s green earth do we expect people to remember Pearl Harbor, an event that happened 74 years ago, when many have already forgotten the terror from 9/11 that occurred just a short 14 years ago? Have Americans lost their resolve? Their will? Their courage? Their honor? Their willingness to stand up for the home front? France’s longtime head of intelligence, Count Alexandre de Marenches, warned 20 years ago of the danger that faced his country. 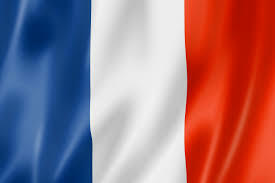 In the Age of Terrorism, the principal challenge to France is the presence “within our nation of another nation we do not understand, whose language we do not speak, whose customs we do not know, whose hopes and aspirations we do not share,” as noted by David A. Andelman in USA Today. 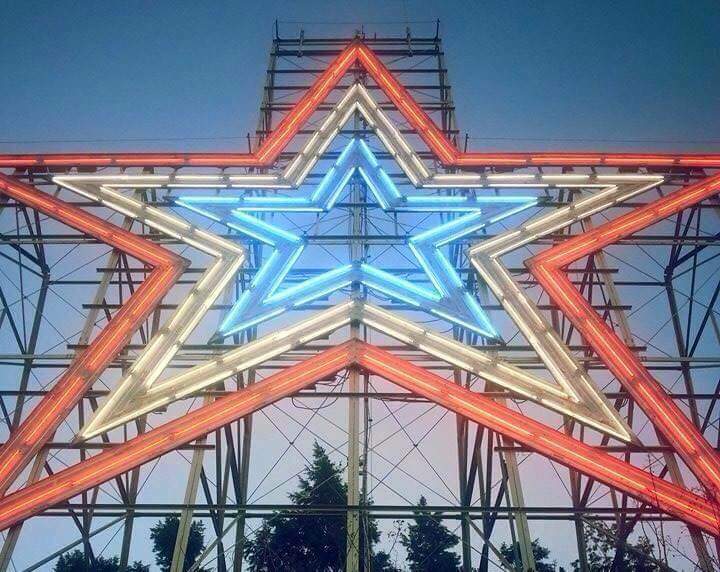 Roanoke’s famous Mill Mountain star is lit in red, blue, and white, the colors of the flag of France, to honors those who perished in Friday night’s terrorism attacks in Paris, according to the Roanoke Times. The display is expected to continue through the weekend. 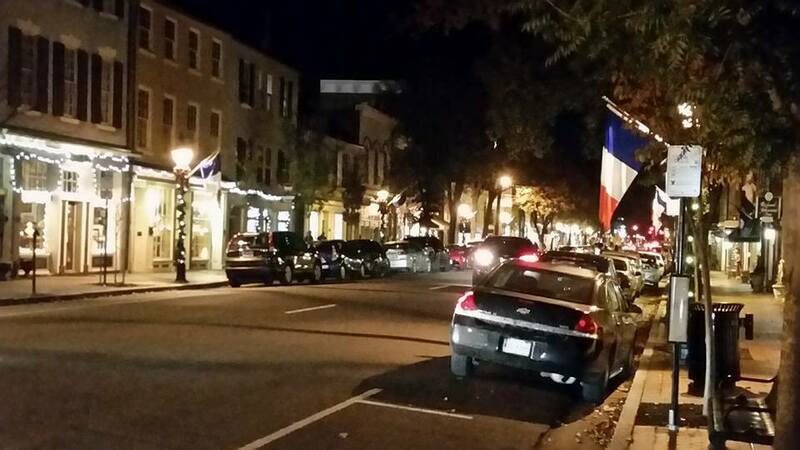 It is just one of many gestures throughout America and the world as they stand with France after over 100 were killed and hundreds more were injured in six separate attacks by gunmen and suicide bombers. Vive la France. 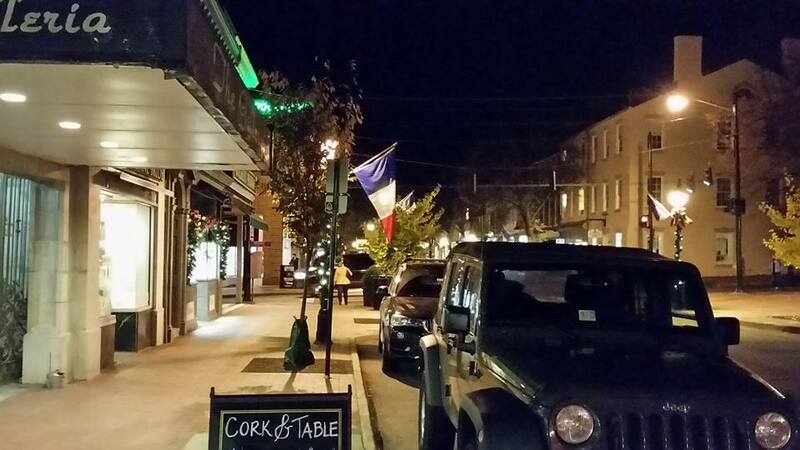 In the wake of the Paris terrorism attacks on Friday night, America has responded. At 8:30pm EST, Sky News is reporting 158 dead as the death toll continues to rise…. President Barack Obama held a news conference. All 2016 presidential candidates have responded. The targets were areas with large numbers of people. French authorities have warned the fatality numbers may go up. They also confirmed there were SIX areas attacked Friday night. America needs to be alert. It has been 14 years since the terrorist attacks of September 11, 2001. We are not immune.